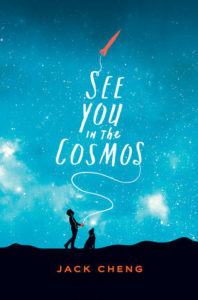 Book of the Week: See You in the Cosmos by Jack Cheng – hello library! Alex Petroski has big plans. He’s going to take an Amtrak to New Mexico to go to a rocket launching convention. He’s going to launch his homemade rocket all the way into space. And he’s going to attach the Golden iPod: a recording he’s been working on. When aliens find his rocket – and Alex is sure they will – they’ll be able to find out what life was like on Earth from listening to Alex’s recorded conversations. But like most things in Alex’s life, his plans don’t work out the way he expected. And before long, he and his Golden iPod and his dog Carl Sagan are off on the world’s unlikeliest road trip with a con artist and a silent Zen master. Alex makes friends, uncovers family secrets, and eats some extremely delicious hamburgers – and records it all on his Golden iPod, so that we get to read all about his epic road trip. And so the aliens can hear about it too, of course.